Splatped Evois an interesting racing game. This game has unique 3D graphics, suitable for all ages. You can experience this game on your browser because it is a flash game. 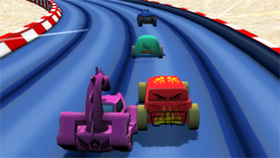 In this game, you will be able to drive the cars that the game offers. You can test normal cars, super-expensive cars or even a fire truck. There are two game modes for you: City Ped and Technical Map. Use T to activate time frame mode. Use space to active the handbrake. Use R to repair cars. You can do anything in this game with your super car.